When it comes to healthy food and taste, I’m the biggest skeptic. I don’t believe they go hand in hand. However, today, I’m a changed woman. Upon following evident trends online about soba noodles and the multitude of possibilities of preparing Asian food that wasn’t all about the grease, I finally gave these godsend, figure-friendly noodles a whirl. This was almost too unreal to eat because it had tremendous punch of flavor and was so low on carbs! That almost never happens people. Believe you me, pasta always tastes better then shredded squash (#Don’tHateMe). Anyways, enough praise, lets get down to business baby! Put a large pot of water to boil with a tbsp. olive oil and a pinch of salt. In the meantime heat a wok and add the olive oil (you can use sesame oil if you want to be very authentic). Add ginger, garlic and the veggies all-together and make sure the wok sizzles when you do that. We’re adding the garlic together instead of adding it first because it will burn by the end of the process. Fry them for 2-3 minutes until carrots cook. Add the soy sauce, canned chopped tomatoes and the ketchup. 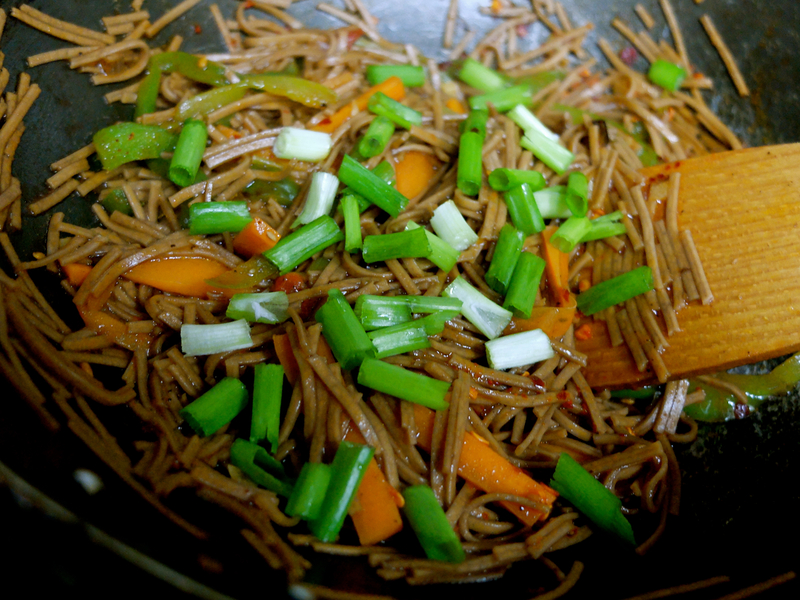 Now, add the buckwheat noodles to the boiling water. They cook within a couple of minutes, so always keep an eye. Strain the noodles and add to the wok. Garnish them with spring onions and chili flakes. Let me know if you guys try it!